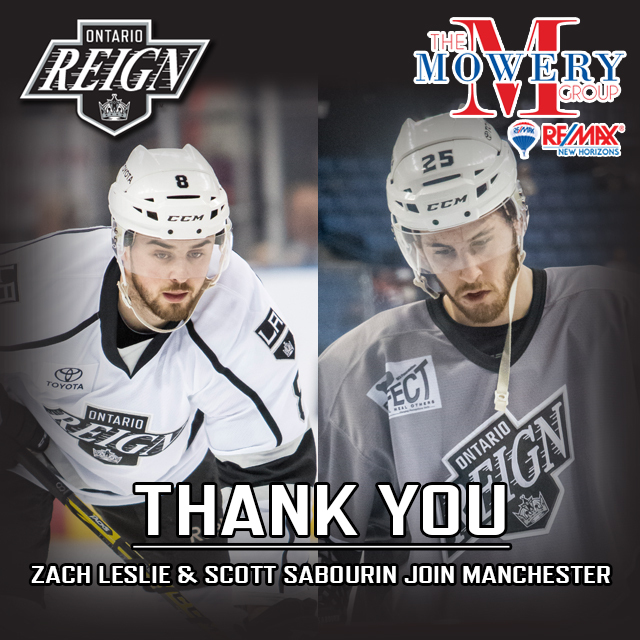 The Ontario Reign have announced that defenseman Zach Leslie and forward Scott Sabourin have been reassigned to the Manchester Monarchs of the ECHL by the Kings on a conditioning assignment. Leslie, 22, holds four assists in 21 games with the Reign this season. The Ottawa, Ontario native is currently in his rookie season after skating with the Guelph Storm of the Ontario Hockey League the last four campaigns. Leslie is a sixth-round selection (No. 178 overall) of the Kings in the 2013 NHL Entry Draft. Sabourin, 23, scored three goals and two assists for five points in 26 games with the Reign this season. The Orleans, Ontario product is his in third professional season and helped the Monarchs (AHL) capture the Calder Cup Championship last season with 11 points (5-6=11) in 51 games.